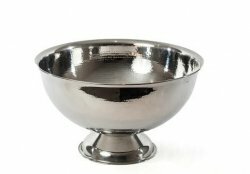 Bel-Air Beverage Tub with hammered chrome finish. This beverage chiller is a beautiful way to present and chill your wine. Don't let your wine get warm! Keep your wine fully chilled at your next party using this fabulous large sized party bucket. Chill your wine, bubbly or beverages easily in this large beverage chiller.